Atlantis Azores offers special facilities for photographers. Large dive deck equipped with fresh water showers, personal storage area. Nitrox and tech diving is available. All greatest diving destinations of the Philippines can be visited including Tubbataha, Bohol, Apo Reef and Coron. Atlantis Azores has only 8 cabins. The boat can accommodate only 16 passengers, that means that you will get a personal service. 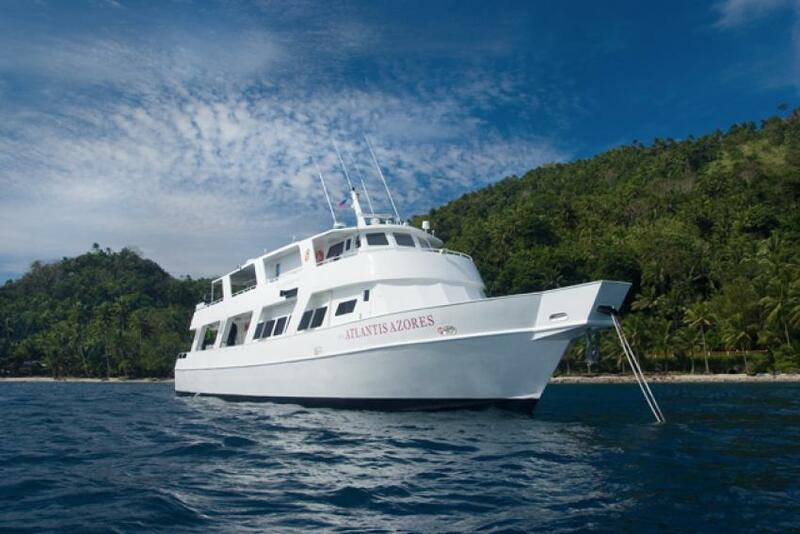 8 deluxe cabins located on the lower deck, they are light, have a double and single bunk bed. There is one Owners suite on the upper deck. This cabin suited for luxury accommodation. It has big windows with a gorgeous view, more space than the other rooms. All cabins of Atlantis Azores is en-suite and has air-conditioner, storages for personal belongings. Atlantis Azores has plenty of entertainment facilities on board. Divers can watch a movie or marine presentation on a big screen, use the boat's library of books and magazines. Non-divers can spend time snorkeling. The boat has a big sun deck with sun loungers and a hot tub. You can relax under the shade or enjoy the sun. Atlantis Azores can offer you special facilities for photography. Boats dive deck has a big table to maintain cameras. Divers can use special storage for photo gear. If you are not a marine photographer yet but it's your purpose, Atlantis Azores offers a special course that will make you a photo pro. Big and spacious dive deck of Atlantis Azores has all the necessary stuff to make your preparation for the dive comfortable. You will find special storage boxes for your gear. Recharge your cameras using several charging points. If you have EANx certification use a nitrox membrane to refill your tanks with Nitrox. There are freshwater tanks to maintain equipment after dives. Safety is one of the main priorities of the Atlantis Azores crew. They know how to manage emergency situations. The boat equipped with first aid kit, emergency rafts, life vests. Itineraries of Atlantis Azores include diving on Bohol and Tubbataha Reef. Bohol is a vast of corals. Strong current brings here a population of different fish. Colorful coral reefs are home for jacks, barracudas, and lionfish. This destination is good for macro diving. Pygmy seahorses, frogfish and plenty of nudibranchs hiding in coral formations. Occasionally manta rays and hammerheads can be seen. Tubbataha is one of the world's most amazing destinations for diving. While diving here you can meet lots of pelagics, like mantas, blacktip reef sharks, gray reef sharks, turtles. Tubbataha National Park consists of 2 coral atolls and a wide channel. You will never forget its colors and an amazing variety of fish. Time in between November and June brings the warmest water and the best visibility. December-March can bring strong winds and currents.